When I first moved to Washington, I saw images of Prusik Peak pop up in magazines here and there, and thought "I MUST GO HERE!" After doing some research I soon found that getting here wasn't a quick walk in the woods. Prusik Peak is one of the Enchantment Peaks located in the Alpine Lake Wilderness Area in Washington. The hike through the Enchantment Lakes basin is 18 miles long, gaining no less than 6,000 vertical feet. Though this hike was one of the hardest that I have done, I was also rewarded with some of the most gorgeous scenery I have ever seen. Prusik Peak is just one icon of an area with endless beauty; countless mountain lakes and tarns, huge glacial valleys, craggy peaks, and larch trees, which turn electric yellow during the fall. 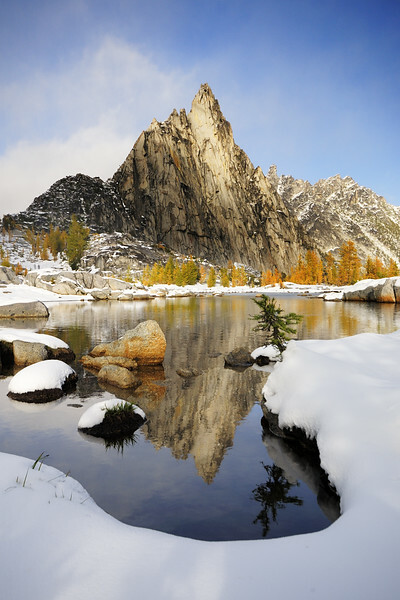 For me, experiencing the Enchantments satisfies a major goal of mine.